With more than 700 indigenous languages, Papua New Guinea is the most linguistically diverse nation in the world. All those different languages, and the different tribal groups they come from, provide fascinating variety in traditional dress and adornment from the Asaro Valley Mudmen to the Wigmen of the Tari Basin and many, many more. But they also make unity a problem. Blessed with abundant natural resources, Papua New Guinea nevertheless wallows in Third World misery. Rampant corruption and crime continue despite the frequent electoral defeat of incumbents. Lay of the Land: Papua New Guinea is located north of Australia and east of Indonesia. It consists of the eastern half of the island of New Guinea, second largest in the world, plus the large offshore islands of New Britain, New Ireland, and many smaller ones. The terrain is varied and includes coastal swamps, large river valleys, highland plateaus and rugged mountain ranges. Ethnic Groups: Papuan, Melanesian, Negrito, Micronesian, Polynesian. Languages: Melanesian Pidgin, a Creole language based on English, is used as a common tongue. English is spoken by about 2% of the population. Motu is also spoken. At last count, there were 832 identified indigenous languages, representing more than 10% of the world’s total of languages. Papua New Guinea was settled some 40,000 years ago by short, dark-skinned hunter-gatherers known as Australoids, the ancestors of today’s Papuans. About 5,000 years ago agriculture-based Austronesians arrived. They tended to settle in the coastal areas and push the Papuans into the highlands. There was, however, much mixing between the groups. Melanesians were the result of that mixing. European explorers visited New Guinea beginning in the 1500s, but never established any permanent presence. New Guinea’s tropical diseases, including malaria, and fierce, sometimes cannibalistic, tribes kept Europeans at bay. There was one disastrous French attempt to colonize New Ireland in the 1870s and 1880s. Most of the settlers died of diseases or were killed by local tribes. Many beachcombers and traders simply disappeared in the area over the years. Eventually Papua New Guinea became the focus of European colonial rivalries. Germany managed to claim the northeast quarter of New Guinea Island and some offshore islands. They established some plantations, but were not very successful. In order to thwart any further German advance, the British seized the southeast quarter of the island and established their own colony. (The western half of New Guinea, along with the rest of what is now Indonesia, was already firmly in the hands of the Netherlands.) Australia, acting as Britain’s proxy, seized the German part of New Guinea during World War I. After the war, the former German portion became a League of Nations mandated territory administered by Australia, which by now was also administering the former British colony in the southeast of New Guinea. In the 1920s and 1930s, explorers began to penetrate the rugged interior highlands of New Guinea, thought to be mostly uninhabited. To their surprise, they found hundreds of villages and thousands of people, each with their own colorful traditional dress and face and body decorations. During World War II there was vicious fighting on New Guinea, as Australian and American troops stopped a Japanese advance over the rugged Owen Stanley mountain range towards the capital of Port Moresby. Earlier, in the carrier battle of the Coral Sea, American naval forces had turned back a Japanese fleet intent on landing troops near Port Moresby. After the war, northeast New Guinea became a United Nations trust territory administered by Australia, which more and more began to combine its administration with the colony in the southeast of the island. By 1975 the parts were combined and granted independence as Papua New Guinea. Things have not been easy for Papua New Guinea since independence. Although blessed with abundant resources, the economy has struggled and is still dependent on massive aid from Australia. Government corruption has been difficult to control and is the main issue in almost every election. Although incumbents are often defeated, the new leaders tend to be just as corrupt and are in turn thrown out at the next election. Papua New Guinea also suffered from a violent secessionist rebellion on copper-rich Bougainville Island. The fighting closed the mine, a huge loss of income for the government and economy, and killed almost 20,000 people. Peace was achieved in 1997. There is also a problem with the land border with Indonesia, which controls the western half of New Guinea. There is a rebellion seeking independence there, and many refugees have fled across the border to Papua New Guinea. Indonesian troops sometimes chase them. Another major problem is crime. Port Moresby is considered the most dangerous city in the Pacific. The United States maintains an embassy in Port Moresby. Relations between the United States and Papua New Guinea are good. There is a fishing treaty that has been in effect for several years providing money to the PNG government. The United States also has many aid programs, including helping rebuild Bougainville and fight HIV/AIDS. In 2007 the United States imported $108,516,000 worth of goods from Papua New Guinea. Green coffee, cocoa beans and fish accounted for 90% of U.S. imports from Papua. That same year the United States exported to Papua New Guinea goods worth $65,889,000. The primary categories included aircraft parts, drilling equipment and industrial engines. U.S. aid to Papua New Guinea for 2008 included $280,000 for military training to enhance border control and maritime security and $2,080,000 to help fight a growing HIV/AIDS epidemic. Human rights problems in the country, which include arbitrary or unlawful killings by police; police abuse of detainees, including children; poor prison conditions; lengthy pretrial detention; infringement of citizens' privacy rights; government corruption; violence and discrimination against women and children; discrimination against persons with disabilities; and intertribal violence. Papua New Guinea's Ambassador to the U.S.
Rupa Mulina took over as the ambassador from Papua New Guinea to the United States in March 2014, about a year and a half after his appointment was announced. Mulina is also accredited to Canada and Mexico. Mulina is from Papua New Guinea’s Central Province. He came to the United States as a graduate student on a Hubert H. Humphrey Fellowship in 1987, studying at Boston University until 1988. Mulina worked his way quickly through the ranks of the Papua New Guinea government. He served as deputy secretary in the Department of Finance and Planning and by 1994 was secretary of defense. In 1996 Mulina was secretary of finance and under his watch, the World Bank warned the government of Papua New Guinea of restrictions on future aid because it had not adhered to conditions of previous programs. Mulina was named to head the government-owned Papua New Guinea Banking Corporation in 1997. In 2003 he became the chairman of the Rural Development Bank. Mulina also worked in the private sector and before his appointment as ambassador was manager of Ambate RG Pacific, a company promoting a geothermal project in Rabaul. He had previously worked as executive assistant to the chairman in Papua New Guinea’s Office of Climate Change. Papua New Guinea's Embassy Web Site in the U.S.
Papua New Guinea’s Embassy in the U.S. The next ambassador to the South Pacific nations of Papua New Guinea, Solomon Islands and Vanuatu will be Walter E. North, a career member of the Senior Foreign Service, class of Career-Minister, who has spent his career at the U.S. Agency for International Development (USAID). Nominated by President Obama on July 10, 2012, North’s appointment is subject to confirmation by the Senate. The Senate Foreign Relations Committee held a hearing on North’s nomination on September 12. Born circa 1950 and raised in Mount Hermon, Massachusetts, North earned a BA in Theatre-Drama at Lawrence University in Appleton, Wisconsin, in 1972, a JD at the George Washington University Law School, and an MPA at Harvard University’s Kennedy School of Government in 1990. North served as a Peace Corps volunteer in Ethiopia from 1973 to 1975, working in Bonga and Addis Ababa, and was a project manager for the non-profit, humanitarian organization, CARE International, in India and Bangladesh. He joined USAID in 1980, and served at USAID Headquarters in Washington with the Offices of East Asian Affairs and East African Affairs from 1985 to 1992. North served a string of overseas assignments for the next 12 years, as deputy USAID mission director in Addis Ababa, Ethiopia, from 1992 to 1996; as USAID mission director in Lusaka, Zambia, from 1996 to 2000; and as USAID mission director in New Delhi, India, from 2000 to 2004, where he also served as acting deputy chief of mission at the U.S. embassy from 2003 to 2004. Returning stateside to USAID’s Washington headquarters, North served as deputy assistant administrator for the Bureau for Asia and the Near East from 2004 to 2005, as deputy assistant administrator for the Bureau for Policy and Program Coordination from 2005 to 2006, and as interim assistant administrator for the Bureau for Africa from 2006 to 2007. 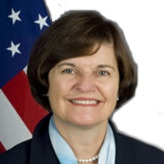 Most recently, North served as USAID mission director in Jakarta, Indonesia, from 2007 to 2011, and as USAID mission director in Cairo, Egypt, from 2011 to 2012. North and his wife, Dr. Judy Ryon, have two children. The United States Ambassador to Papua New Guinea, Leslie V. Rowe, began her appointment on October 15, 2006. She is also the ambassador to the Solomon Islands and Vanuatu. Rowe received a B.A. from Washington State University, an M.A. from the Fletcher School of Law and Diplomacy, and an M.Ed from Northeastern University. She also received a certificate from the Sorbonne in Paris, France, and was a Fulbright scholar in Germany. She taught foreign languages in high school and became the Director of the International Office of Tufts University. Joining the Foreign Service in 1983, Rowe served in San Jose, Costa Rica and Sao Paulo, Brazil. She was Principal Officer at the U.S. Consulate in Recife, Brazil; country desk officer for Chile; Director of the Office of Children’s Issues at the Department of State; Consul General in Lisbon, Portugal; and Consul General in Bangkok, Thailand. Her most recent posting before taking her position as ambassador to Papua New Guinea, the Solomons and Vanuatu was as Deputy Chief of Mission at the U.S. Embassy n Nairobi, Kenya. Rowe speaks French, Portuguese, and Spanish.